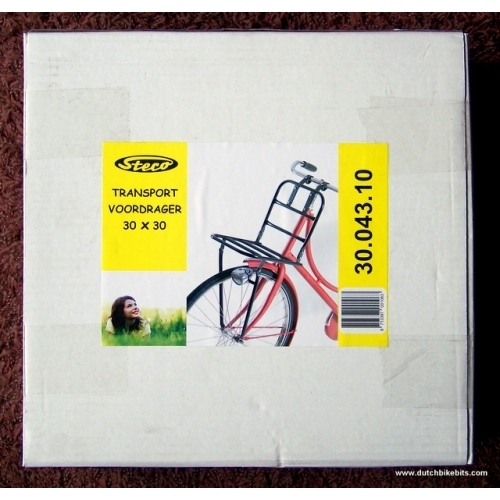 The Steco Transport Handlebar mounted front rack connects to the forks at the wheel axle as well as to the handlebars of your bicycle. Because this rack rotates with the handlebars there is no conflict between handlebars and luggage. 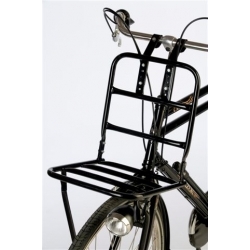 Therefore this rack gives the maximum flexibility with regards to the size of object that can be carried on the front of your bike, but with the drawback that weight carried will have a greater effect on the handling of your bike. 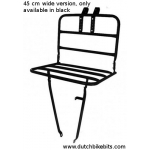 Because this rack does not fit to the down tube, it will fit a wider variety of bicycle frames - including the mountain bike frame shown in the additional images. 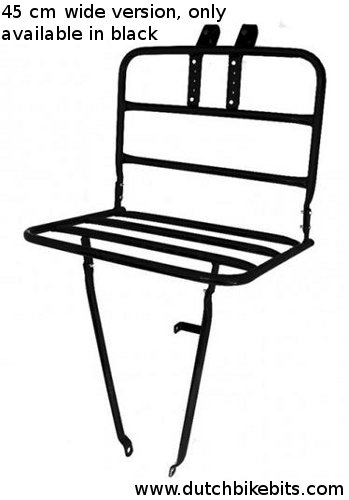 The load area of this rack is 30 cm wide by 29 cm front to back. The back of the rack has a height of 33 cm. 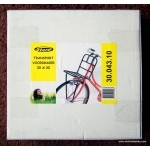 It requires a distance between front wheel axle and handlebars of between 65 cm and 95 cm. This rack permanently mounts to the bicycle. It is secure against theft because several steps are required to disconnect it. A flat area in the centre of the handlebars 13 cm wide is required for fitting. The attachment to the handlebars is adjustable for height and can be set between 30 cm and 43 cm from the flat bed of the rack. Photos in "additional images" show this. 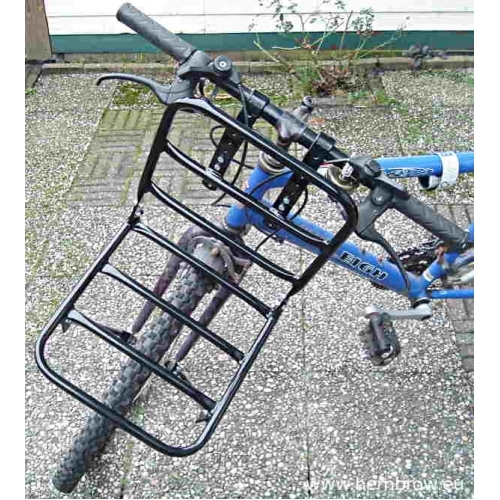 The rack is designed to fit all normal handlebars. If your bike has relatively "fat" handlebars, then you may need two slightly longer bolts for fixing to the handlebars. 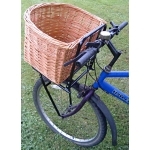 Note that this rack will definitely not work on a bicycle with front suspension as while the distance between the front wheel centre and handlebars can be varied a lot at installation time to fit most bikes, it must not change as you ride along. Also note that for safe installation you need to have a front wheel with wheel nuts. This rack is not designed to be used with quick release wheels. Recommended accessories with this rack are a steering damper and a double kick stand. The rack includes a mounting bracket suitable for most front lights - lights are shown mounted in some of the photos (no light is included with the rack). 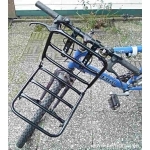 Two other version of this rack are available: A smaller version for adult bikes and a smaller version for childrens' bikes. A 45 cm wide version is available as an option on this page.